For further background on Premium Wine Group (PWG), please read my earlier post, Oenology in Long Island: Premium Wine Group—John Leo. NOTE: While Premium Wine Group makes wine for its many outside clients, there are also the wines of three of the employees that work there: John Leo, production winemaker, Russell Hearn, Managing Partner/Director of Winemaking, and Eric Bilka, production winemaker. While this article is, foremost, about Premium, it also includes sections devoted to the wines of these producers. 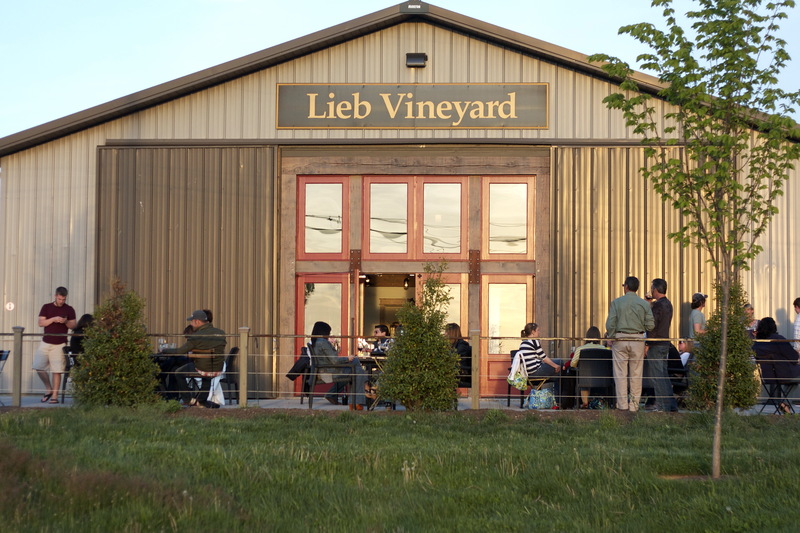 (The winegrowing at Lieb Cellars (owned by partner Mark Lieb) and its wines will be the subject of a separate article, as will be the case with Clovis Point, whose wines are made by John Leo. Because I interviewed both John and Russell separately, and the conversations were so extensive, I’ve divided the interviews into two posts: The first was based on my conversation with John, and was published on January 30. I was then away for six weeks on a cross-country trip and another week was recently spent in Northern Virginia (I was exploring vineyards on both occasions), so I have only now published this post based on my interview with Russell, which also includes discussions of T’Jara Vineyards and SuhRu Wines. Jed Beitler, Russell’s partner at T’Jara, contributed, by e-mail, a discussion of how he and Russell work out the blends for their wines–his comments are follow the interview with Russell. With 30 years of winemaking experience, in Australia, New Zealand, France and the USA, Russell Hearn has taken his Australian training with him throughout the journey. 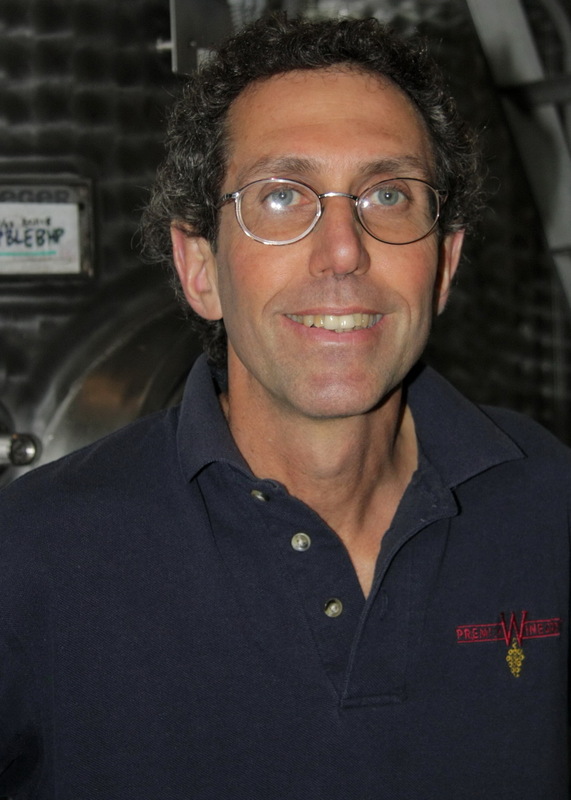 During the last 20 years on the North Fork of Long Island, Russell has established himself as an industry veteran who has helped forge our region into one known for producing World Class Wines. As winemaker for Pellegrini Vineyards, in Cutchogue, since 1991 Russell garnered five 90-point scores from the Wine Spectator. Russell continued to drive the style and quality of Pellegrini Wines for almost two decades [until August 2012]. He has consulted for a number of wineries on the North Fork of Long Island, in the Finger Lakes, in New England and in Virginia. He has lectured at Industry Technical Conferences in: New York, Massachusetts, Maryland, Pennsylvania and Virginia. JM-L: John [Leo] just mentioned that PWG has more than 150 different lots of wine. RH: Yep. Well, really, we actually have closer to 200 fermentations. Of that 130 are different lots. JM-L: So of course that means that you are blending some of these fermentations. JM-L: What brought you to Long Island all the way from Australia? JM-L: It happens so often! RH: I worked in the industry in Australia, then exchanged for one harvest to Burgundy, and another year exchanged a harvest in New Zealand, and while I was there I took some vacation time, backpacked around New Zealand, and met this American girl at that point. Then she came to visit me in Australia, when I went back to work for Houghton Wines in Australia, and the next year I went on an exchange internship to California, so I went across and visited her in Massachusetts. There’s not much winemaking going on in Massachusetts, but I decided to stay for a while. Then I went back to Australia, then came back then went to Virginia for two years, then Long Island. We’ve been married now for twenty-seven years. It was either Australia or East Coast; California, Oregon, Washington didn’t really interest me. JM-L: For what reasons, may I ask? RH: For a combination of personal reasons and professional ones. California—large chunks of it—has what a winemaker can see in Australia, the climate’s just like it is in Australia; Oregon’s too far from the ocean, Washington State’s too far from the ocean—regions that don’t fit my personal objectives. JM-L: I see. So you really like the ocean—water life, sailing, surfing, swimming . . . .
RH: Sailing, swimming, surfing that’s right. I want to be close or in the water a lot, and I didn’t know that until we lived in Virginia for two years. And as pretty as the Blue Ridge Mountains are, we were three-and-a-half hours from the water and I realized that it didn’t work. JM-L: Were you working for a winery there? RH: Yes, a winery called Dominion Wine Cellars, it’s in Culpeper. It doesn’t go by that name anymore; it was bought by Williamsburg Winery three or four years after I left. And then I came here, consulted for several wineries initially; then for Bob and Joyce Pellegrini in late ’91, when they were looking to design a winery, I worked with local architects as they designed the facility; I designed the production part inside, it was built, I was with them for their first vintage in ’92, and I was there full-time until 2000. Then we I thought of Premium Wine Group, so I was starting this with two other partners, Mark Lieb and Bernie Sussman, I switched to a consultant role at Pellegrini—a very active consultant until the last vintage, 2011—and it’s stopped as of this vintage. JM-L: I see. So now you’re full-time here. RH: I finished up, yes. Being full-time here, yes. I was doing that in addition . . . .
JM-L: I don’t know, you people in the wine trade in Long Island seem to have to find more things to do and you’re all working—probably—80-90 hour weeks. RH: It keeps it interesting . . . .
JM-L: It does. I don’t have that kind of energy, but I certainly enjoy writing about it, drinking it, and I especially enjoy meeting and speaking to people in the trade. They’re very interesting. They’re not just farmers, and they aren’t just chemists . . . .
RH: Yes, it’s a combination of . . . . There aren’t too many industries in which you have to have so many tiers that you must have at least competence in: growing it, making it, marketing it, managing it, so that makes it very challenging and very interesting. JM-L: Yes. Well, you must have always had a very high organizational sense. You couldn’t possible have conceived of this business—PWG—if you didn’t. RH: Hm. I think the best thing that one should do in starting in the trade or starting from school is to work at a large winery. The winery at which I started in Australia—Houghton’s—made about 800,000 cases. 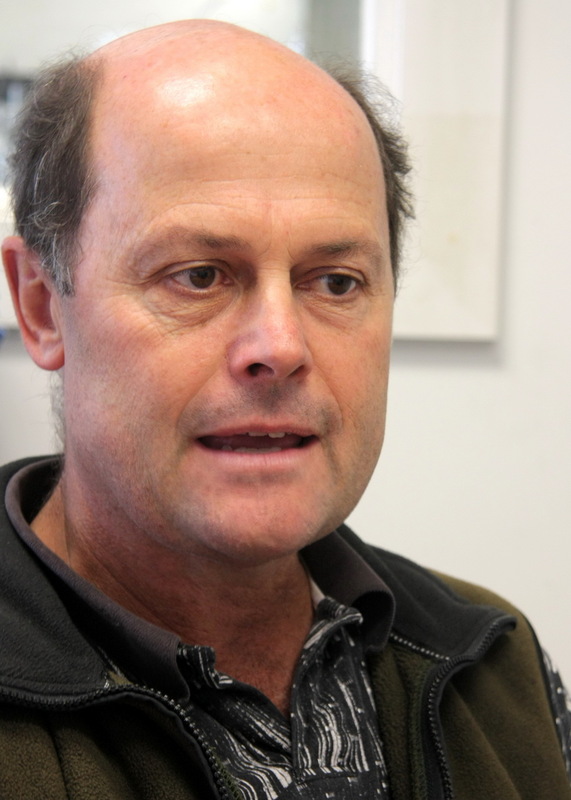 So it’s not a huge winery—Hardy’s, which owns Houghton’s, makes five and a half million cases. In a huge winery you’re pigeon-holed, in a large winery you’re forced into an organizational necessity . . . because you’re not as big so you have to do everything to make good wine, and that’s critical in winemaking. It’s not only how you do it or where you do it, it’s also when you do that is critical in winemaking. If you start off in a small winery, or only work in a small winery, you don’t get those organizational skills, because they never needed to, that force you to think ahead. JM-L: Yes, just learning by the seat of your pants . . . learning on the job. RH: Houghton’s was very organized so I was exposed to a good organizational structure, which as a result allows me to do this relatively comfortably. There are a lot of moving parts in the shuffle, so we need to make sure that people are paying the correct amount of attention and timing things so that they run on schedule, do deliveries. It’s not really so much of an issue: we have several full-time people, we have additional interns at the time of harvest [when the grapes are brought in to PWG]. We have good people who we’ve hired over the last twelve years. John’s been here twelve years, Eric has been here eleven, Rinaldo’s nine, Rosa’s eight, and Andrew started four years ago. Patrick’s been here a couple of years. . . we haven’t had a lot of turnover. We all know what has to be done and we have some smart people here, and so far it’s been turning out well. JM-L: So everyone’s on salary. How many people are there in all? RH: Eight full-time people and four additional people during harvest. 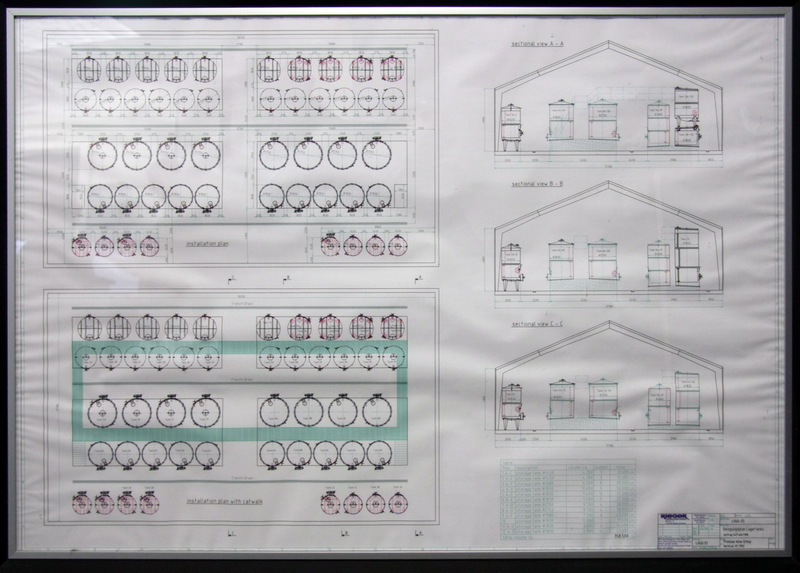 The winery is working 18 to 20 hours a day, with a lot of automated procedures. So from September through November we get people from different parts of the world in the industry. We have two Australians for this harvest, a girl from Hungary in the industry, and an American. So we go from five days a week for nine months of the year to seven days a week and then in two shifts. So at this stage the night shift will be coming in about ten minutes . . .
JM-L: They work until midnight? RH: Yep! As the harvest progresses—as we get into the second half—in October they’ll start coming in at 2:00pm or 3:00pm and work until 2:00-3:00am. JM-L: Are they sleeping by the vats? RH: Not yet! Not yet. JM-L: Temperature control has changed that, hasn’t it? RH: Yes, yes, exactly. We have a lot of technology here that allows us to sleep well. So the winery will be operating 18 to 20 hours a day, seven days a week, from September until about the week of Thanksgiving, after which we start packing it in. We go back to six days a week for a while and then back to five days. JM-L: And then you go back to having a life of your own again. RH: Yeah, my wife says that she’s a “harvest widow” for a period of time, so . . . .
JM-L: A “harvest widow”—that’s good! So I just posted, recently, a piece on Raphael, and one of the salient facts about Raphael is that it cost six-million dollars to build that facility. That’s very deep pockets for a great deal of money . . ., but then it’s a showcase. You’re no so concerned with being a showcase, so much, though your facilities are attractive, but of course highly functional. How much did it cost to build this facility? RH: Well, in today’s dollars it would be north of six-million, but as you can see it’s predominantly equipment. Therefore the saleable value, if you will, is real because it’s all asset. I mean, the building is an asset obviously, and the building cost, in today’s dollars, might be a million, since it’s a metal building, it’s concrete, it’s not aesthetic. It’s practical, functional. Setup prices would have been three-ish million. JM-L: Yes. Well, Raphael went so far as to design their winery so that it could use gravity feed, which is also a very expensive proposition. Would you someday incorporate that into your facility? R.H: Ultimately we can use fork lifts and gravity, on that level, so we don’t have a tier setup—everything’s one level. But we have some —I like to think—real quality additions to our equipment that really minimize the effect of not having gravity [feed]. We don’t pump skins—red-grape skins—everything is gravity because we drain the tank and put the skins into bins that are then fork-lifted back to the press. A lot of wineries don’t do that, so they pump the skins to the press. We don’t do that, and we try to be very gentle on the wine. And we have bulldog Waukesha pumps which push nitrogen rather than pump . . . they’re Waukesha twin-lobe pumps that are the gentlest in the industry. But they’re very expensive and for a small winery to have a Waukesha pump would be cost-prohibitive. We have four of them because we’re trying to make an affordable way of making quality wine. We have equipment here that isn’t anywhere else on the North Fork and the only ones on the East Coast, on some levels. JM-L: Really? So you really are a premium Premium winemaker. RH: Winemonger [chuckles]. We kicked around the idea of being Premier—being the first—and that didn’t really carry the concept of being Premium, and we have a high number of quality wines that are coming out through this facility. We allow people to do what they want to do so, depending on how high a bar they’re shooting for, I think that they can get that at this facility. JM-L: Right. Very interesting. I was speaking to John [Leo] about his involvement and how you work with your clients and he said that you are, essentially, the cellar crew for the clients. Obviously, you get your marching orders from the consulting winemaker they hire and there are so many approaches that can be taken to making wine. You have to adapt to so many requests—do it this way, not that way—do that many pumpovers, no pumpovers, and so on . . .
RH: We have to be flexible for their needs. We’re assisting them in making their wine, we’re intimately involved in the quality control, with their practices and their whole organization. But the stylistic choices are 100% driven by the producers. JM-L: Until recently Duck Walk was selling a magnum of their Chardonnay for $10, which is a terrific price, but they don’t have that anymore. Obviously, it isn’t possible to sell much wine at prices that low. Your costs out here are too high . . .
RH: It wouldn’t be economically viable in the long term. The one thing that we have is quality, which means that we have to sell on quality and we have to be realistic about how much we can ask for those quality products. So, where is that? It’s in the high teens and up. JM-L: So, do you have special equipment to make sparkling wines? RH: We do. We have all the equipment that we need for riddling [a fully-programmable 1,000-bottle automatic riddling machine] and disgorging, and bottle washing, and capsule pleating, and so on, so we do offer that service. JM-L: Do you also provide for aging . . . ? RH: Once it’s bottled, we do not continue to store wine here; so each producer would warehouse their wine elsewhere. Ours isn’t large enough for it; we can’t keep any volume for any length of time. JM-L: That wasn’t your intention to begin with. RH: No, were we to expand into something like that, we could. But we’re already full with tanks and barrels. JM-L: Have you had to expand with more tanks and so forth as the business grew? Let’s take a look at the diagram. Locations of tanks, this is the main tank room . . .
. . . and then we have external tanks and additional tanks near the bottling area. So in the original setup these tanks [pointing, above] were not here. These others [pointing to other tanks outlined in red] were not here—these four. In the second year we’ve added all of these and in the fourth year we added some outside. In the fifth year we added a substantial number outside and in the seventh year we added more tanks outside and just last year we put in another eight tanks. So when we started in the first year we had sixty-five tanks and now we have 125, so we’ve nearly doubled our capacity since or first production. We now use about 70% of our total capacity so we have room for more tanks. Do I think we’ll add more? I think it’ll be a few more years before we increase our capacity. We do have some organic growth—we’re adding more people. JM-L: Exactly. Now, you also have your own label: Suhru. RH: Two, actually. 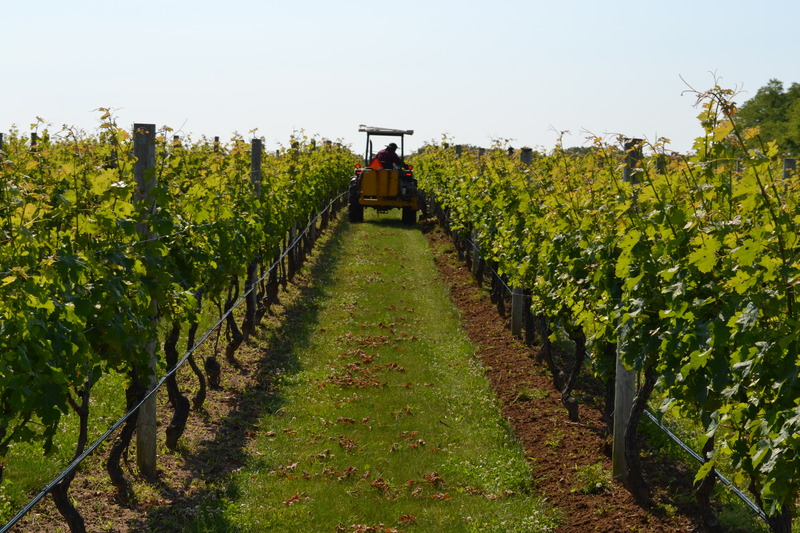 Suhru, which is Susan Hearn and myself, and we work with growers around the state, mostly in the North Fork and the Finger Lakes, to source the fruit that grows best in those regions, so we bring Riesling from the Finger Lakes and Shiraz and other red fruit from the Island here. So my wife and I and another couple that we’ve known for twenty years, bought a piece of land here in Mattituck in 2000, and planted it in 2000 and 2002. We sold fruit initially, and then in 2007 we started T’Jara Vineyards. JM-L: Oh, yes, T’Jara. Isn’t that based on an Australian word? JM-L: I see. Does it sound like that when an Aboriginal pronounces it? RH: Yes, T-Jara. You know, I guess you could say that it’s the Aboriginal word for terroir, although they don’t grow grapes there; they never have. JM-L: Yes, though I’m sure that today many Aboriginals work in the wineries. 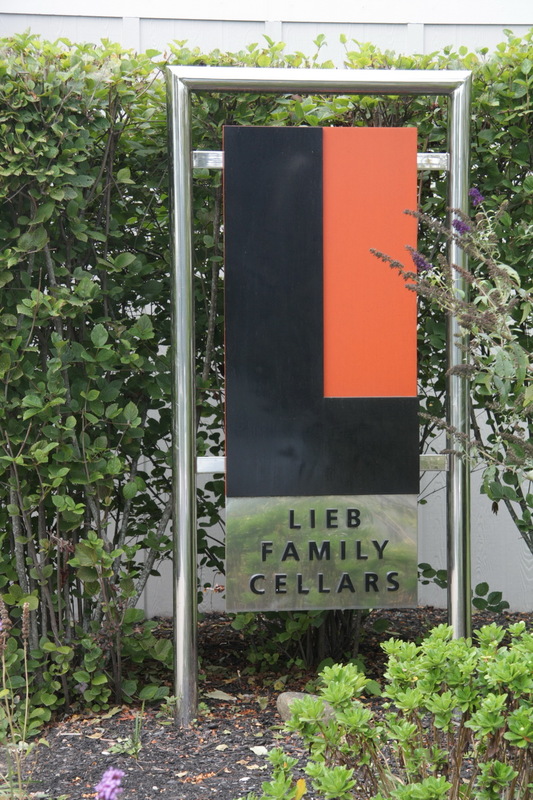 JM-L: Are there any Aboriginals who actually own their own wineries? RH: Well, not that I’m aware of. I’m no longer really that connected [to the Australian wine industry] to know about that. But I suppose that there are. JM-L: I ask because in South Africa there is a program to help get black Africans into the business. This is true of the South African label Indaba . . . .
RH: Oh, yes, of course. They make a very nice Chenin Blanc. JM-L: Getting back to Suhru and T’Jara, Do you have styles that you wanted to make that would stand out from what everyone else does? RH: Yeah. Suhru is a little more of a niche in that we are not going with mainstream varietals. 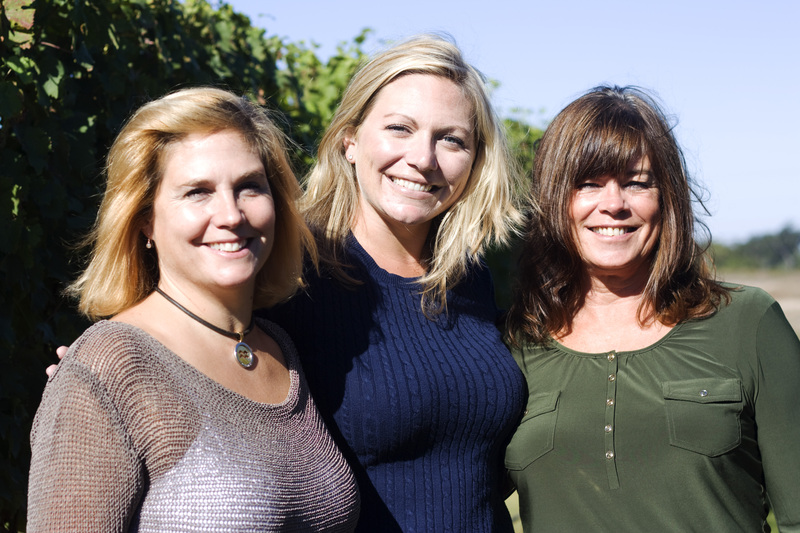 We do not make Chardonnay; we don’t make Merlot as a varietal, or Cabernet Franc. We don’t make varietals from these three main varieties that we have out here. We do utilize the red ones in our blend, but the goal of Suhru is to make wines that we enjoy drinking: crisp, vibrant, good-acidity whites, and some quick-to-market, soft, juicy reds. More mainstream in respect of pricing, mid to high teens, and in approachability. T’Jara is sort of aiming for the high end of the market out here. We all have to aim high, shoot for the moon, but we aim to make the best red wine out here: the fullest—but, soft wines that will age because of the quantity of tannins plumper but lusher. JM-L: So you pick the grapes as late as possible? JM-L: You want them to go beyond their phenolic ripeness? RH: Yes. So they’re barrel-aged for a long period of time but they’re not designed to be oaky wines. JM-L: So you use a lot of used oak? RH: Well, reasonably so, but everything’s Hungarian, and Hungarian oak is very tight-grained so it doesn’t give up the flavor as much as other—the French—would be. That doesn’t imprint on the wine heavily, so it keeps that soft plumpness. We use old oak barrels—one to seven-years-old ones so as to get the benefit of aging but without the imprint of tannin. Typically we don’t go for that long maceration that, you know, leads to that astringency level that needs time. They’re big wines but their big, soft wines. JM-L: They’re almost ready to drink by the time that they’re released? RH: Absolutely. The goal . . . that is goal number one. You do not need to age them—they will benefit if you age them, but you don’t need to do so. Stylistically, for example, Pellegrini’s wines [made by Russell], over the years, have rewarded aging. But that’s a stylistic choice. We looked at that model and Jed Beilter [Russell’s partner at T’Jara], Laurie, and Sue and I decided that that wasn’t what we wanted and we wanted our wine to give pleasure from the beginning. So from a brand standpoint, there’s a separation in terms of the market segment that each is shooting for. In price separation as well. Suhru is a brand; at T’Jara we make only as red wines: Merlot, Cabernet Sauvignon, Cabernet Franc, and Petit Verdot are planted there. JM-L: So how many cases of wine are you able to produce? RH: Well, we have seventeen acres under vine out of twenty acres of land, so ultimately we’ll have 3,000 cases; right now we have about a thousand cases. JM-L: I see. And what’s the density of your plantings? RH: 7 X 5 and 7 X 4. Cabernet Sauvignon and Petit Verdot are 7 X 4 we’re trying to carry as little per vine as possible. Merlot is 7 X 5 and Cab Franc is 7 X 6—Cab Franc is more vigorous . . . .
JM-L: Well, that seems to answer the question of why one chooses a density of 7 X 5 or 7 X 4 or 7 X 6—it has to do with the vigor of the vines. That makes sense. OK, so T’Jara . . . and Suhru? RH: Suhru is producing fifteen-hundred cases. T’Jara is a thousand cases. JM-L: So for T’Jara you’re harvesting what? About two-and-a-half tons an acre? RH: Yes, about two-and-a-half to three tons, depending on the year and the variety. More on the lower end for Cab Sauv, closer to three on the Merlot. JM-L: Russell, thank you very much for the time you’ve given me. This conversation was a pleasure. The process actually begins much earlier in the vintage year with how the growing season has gone. Depending on the strength of the season, we’ll know which component varietals we’ll have to work with. For example, 2007 was both a long and a very hot year. A spectacular year all around. So all our fruit showed beautifully on the vine. That includes our Cab Franc, our Merlot, our Petit Verdot and our Cab Sauvignon. In 2010, just to compare vintages, it was a hot year, but not as long a year. The Cab Sauvignon didn’t ripen to a state that we felt was good enough to put in our wines. So you won’t see that component fruit in our 2010 releases. This past year, 2012, was also a very strong growing season and all our component varietals grow to maturity. Each year, however, the fruit shows different characteristics. So you can’t always assume that the Merlot that came out of the barrel in 2012 will be the same as every year preceding that. It’s always a clean slate when it comes to blending a particular year’s components. The process Russ and I go through is the same every year we’ve worked together. We assemble the component varietals and look to see what possibilities exist. As you can see from the photo, it’s not the most romantic picture of what transpires. 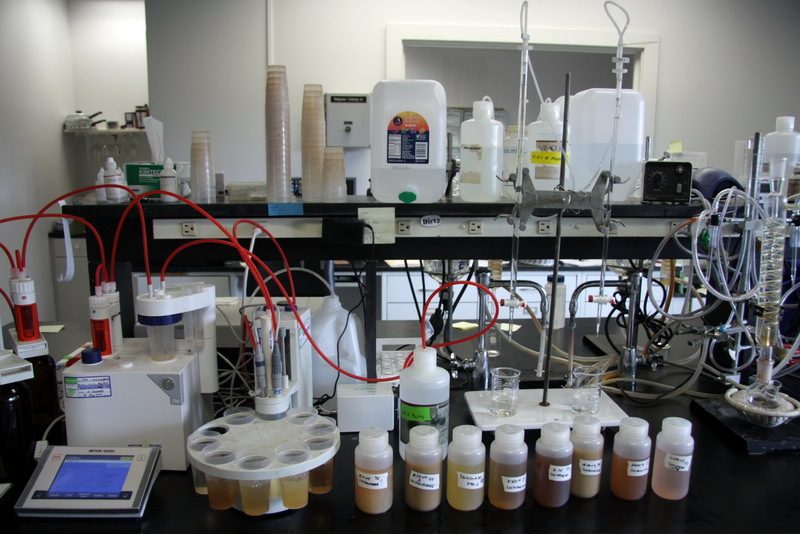 Beakers, water baths, pipettes all arrayed on a conference room table. It also helps that Russ and I learned early on that we had very similar tastes in terms of our palates. 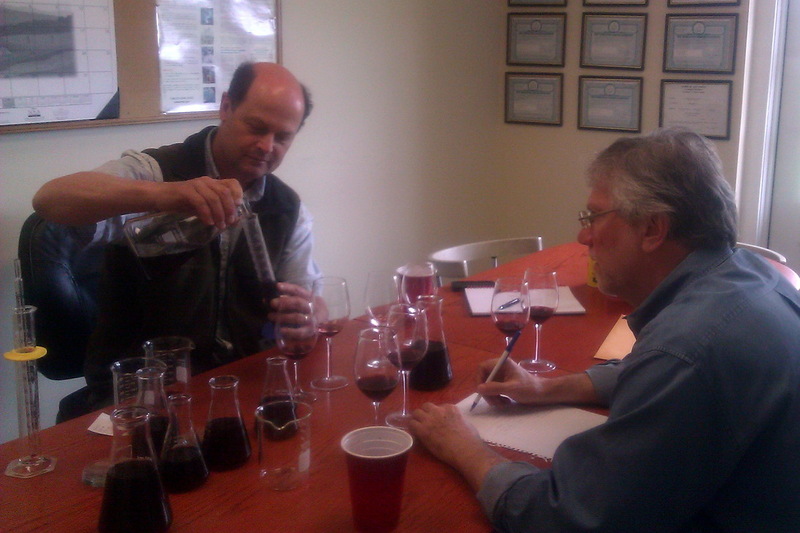 When Russ was the winemaker at Pellegrini, he first brought me in to their conference room for a similar exercise. We had three flasks, filled with either Cab Sauvignon, Cab Franc or Merlot. We each had to come up with three blends: a Cab Sauv, a Merlot and a red blend. Blinded from each other’s admixtures, we each came up with three offering and presented them to each other. the three blends were all very close to each other and, as we had previously experienced, cemented the fact that we were of similar minds when it came to what we thought would be best in the bottle. This year, we are dealing with four or, potentially five component varietals to make our wines. Initially, we didn’t think we would release a red reserve in addition to the Merlot and the Cab Franc. While 2012 was a good growing season, we just weren’t sure that we’d have a reserve that would be good enough to release. As the process unfolds, we start with one of our wines. As you know, for a wine to be called by its varietal name, it must contain at least 75% of that component fruit. Anything after that is up to the winemaker. Anything less than that has to be called a blend or some other nondescript name. Russ and I went through the Merlot and the Cab Franc. We started with the minimums and tested a number of different combinations of supporting varietals, each to bring something specific to the blend. Maybe it was more roundness. Maybe it was more length. Sometimes, we are trying to balance the various smells coming from the component fruits: red berry versus darker stone fruit; more chocolaty or tobacco notes versus more jammy qualities. All those ingredients are what we are trying to balance to achieve a wine that, year over year, will have a similar (not necessarily the same) consistency that those who have tried and liked our wines will come to expect as the years roll on. To our surprise, we not only were able to come up with what we feel are very formidable Merlot and Cab Franc blends, but we also came up with a reserve blend for the 2012 that we are very proud of. From the initial sampling, we went through iteration after iteration of blending options. It kind of surprised us when we focused in on the final option. But we’re very happy with the result. That whole process, going from large fractions of blending components to the fine-tuning took over three hours. But the process doesn’t stop there. And I’m sure Russ can add further to this discussion here, but he’ll take the blending notes from our session in the conference room and start the process of putting the final blends together in the barrel. He will still tweak a particular blend as it matures in our Hungarian oak barrels before it’s ready for bottling. Maybe a touch more Cab Franc here, a slight addition of Malbec there. That’s all part of Russ’s magic as a top-flight winemaker. In the end, it’s all part of the joy we have as partners in coming up with wines we are proud to call T’Jara. This entry was posted in Vineyards, Vinification, Wineries and tagged Bernie Sussman, Dominion Wine Cellars, Erik Bilka, Houghton Wines, Jed Beitler, John Leo, Leo Family Wines, Lieb Cellars, Long Island Wineries, Mark Lieb, Oenoconcept, Pellegrini Vineyards, Premium Wine Group, PWG, Russell Hearn, Sherwood House Vineyards, Sick International, Southport Lane, Suhru Wines, Susan Hearn, T'Jara Vineyard, Tube-in-tube Must Chiller, Vaslin Bucher FX3, Vaslin Bucher FX8, Williamsburg Winery, Winemakers Studio on 2 June 2013 by JoseM-L. Premium Wine Group is a contract winemaking facility designed to allow an economical way to produce wine without the huge investment in equipment and facility. The individual style is driven by each Producer / Client in the production of their wine. PWG is designed with an array of technologically superior equipment which allows our clients complete freedom in producing wine. Our experienced staff of wine production professionals allows our clients the comfort that their wines are being handled in the highest quality practices. Established in 2000, an initial 545 tons were received, we have steadily grown to 1,000 tons with an ultimate capacity of 1,400 tons. Premium Wine Group’s mission is to continually upgrade plant, equipment and services to allow our Producers / Clients the highest quality environment in which to sculpt their individual wines. This is evident with more than 18 Wineries producing over 100 individual wines each vintage. Because I interviewed John and Russell separately, and the conversations are so extensive, I’m dividing this post into two parts: The first (this one) is based on my conversation with John, and subsequently my interview with Russell, which also includes discussions of T’Jara Vineyard and SuhRu Wines: Oenology in LI: Premium Wine Group–Russell Hearn. Personally, I found John to be thoughtful, articulate, soft-spoken yet straightforward, as well as clearly professional in outlook and attitude. It was a pleasure to converse with him. JM-L: I want to begin by asking you about your client list on the PWG website. I recognize all of the names but on [see below], but there is one that puzzles me, DeSeo de Micheal [sic], but actually that’s Deseo de Michael . . . What’s his full name? JL: Michael Smith. His wife is Puerto Rican, so I think that she anointed the name. JM-L: So that explains that mystery. Well, one of the reasons that I called you was because I’d been in touch with Chiara Anderson Edmands, and she’d said that one of the people that I have to speak to is you. So the advantage of speaking to you now is that I can now speak to you of your wine, their wine, and possibly Sherwood House, because I will be speaking to Bill Ackerman, the vineyard manager. JL: You know, the consulting winemaker for Sherwood is Gilles Martin, so he’ll have more answers about style and things like that, but about the logistics part I can help out with because it all does come in here. JM-L: So Gilles and Juan—who used to work here—and other consulting winemakers formulate what they want you to do and how do you work with them? How do they formulate what they want you to do? JL: Well, we sit down to talk about that. I guess that in a stand-alone winery the winemaker is not only making the decisions but lifting the hoses and doing the work. But they usually have assistants, especially around harvest time, so they’re making their own plans about how much tonnage to bring in, how to ferment it, etc. etc., and their usually delegating that to their assistants in the cellar. So in a sense that’s what we are . . . we’re custom production, so the consultant tells us that he will bring in 5 tons of this Merlot, 6 tons of that Merlot, we want you to handle this one way and that another way. So we’re basically the cellar hands . . . we’re the winemaking service for that . . .
JM-L: So you are, in effect, the cellar assistants. JL: In a sense, yes. 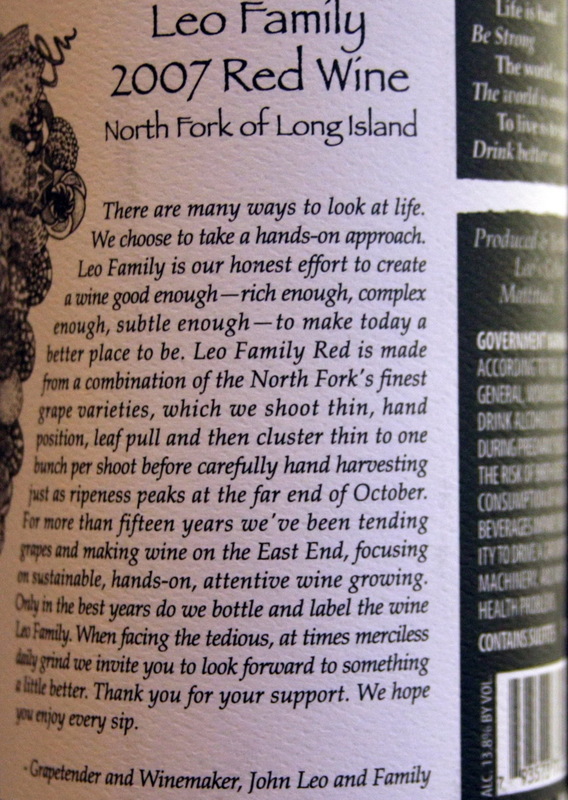 JM-L: Except that you actually do all the hands-on of making the wine . . .
JL: So we’re the winery with the labor to get the job done that they want, but in terms of how they formulate things, it’s straightforward, just like in any winery, they decide how they want to handle certain batches, what yeasts to use, what temperature to ferment at, how often to pump over, all those decisions they can make to then communicate them to us and we do the work. JM-L: The thing, of course, is that they’re not being hands-on, so what happens when some kind of issue, say a stuck fermentation, takes place (which I’m sure doesn’t happen too often) . . .
JL: Not too often, no. JM-L: or, for example, a temperature issue with the tanks, or you find that the amount of pumping over that they request perhaps is not optimum for the wine as its coming out . . .
Also, a lot of our newer clients, for example Deseo de Michael, say, “I want to bring in my grapes this year, 600 pounds . . .
JM-L: 600 pounds. Well, if you only have a third of an acre . . .
JL: Exactly. So the first thing I explain to him if you want us to press it, that we need more than that because our presses aren’t that small, so we can’t press 600 pounds effectively, so you’re going to have buy some Chardonnay to put in with yours to make it. So he’s so small that it doesn’t make sense to have a consultant, you know, realistically, but the first year I helped him through that and I didn’t charge him anything, and I said, “You know, you can do it this way or you can do it this way. Here’s the decision points now. You can taste the juice coming out of the press, do you want to cut it there? Do you want to keep on pressing harder? You’ll see the change.” So we just walked him through it. So for 2011 he hired Gilles [Martin] to be his winemaker for his one Chardonnay, so now it’s at a more professional level. JM-L: Good. But the vines must be very young . . .
JL: Sure. So that’s an extreme example of someone who wants to do things right, is willing to pay commercial charges, but he doesn’t have enough volume to get a full-time consultant . . . so we try to be as helpful as we can. JL: We have other clients like that, they have a little bit of fruit in their back yard, so we try to avoid it, but when it’s a friend of a friend, we do stuff like that . . .
JL: You know, Juan [Micieli-Martinez, Manager and Winemaking Consultant of Martha Clara Vineyards], Gilles [winemaking consultant to several vineyards], Tom Drozd—who makes the Baiting Hollow wines, and Erik [Bilka, the other PWG production manager] has his own wine, and other clients who know what they’re doing. So we expect them to make all those decisions, so we’re just backing it up. 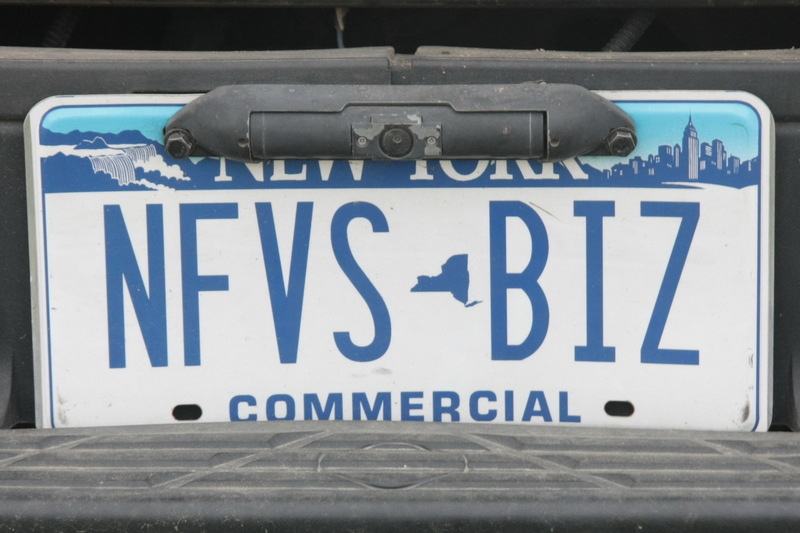 We do have some non-Long Island clients, but that is just coincidence. JM-L: So who are your non-Long Island clients? JL: Well, you know, Silver Springs, up in the Finger Lakes. JM-L: All the way up there? Do they send their fruit down? JL: Mmm, no. When they started five or six years ago, they bought Long Island red, so they make some things up there in the Finger Lakes, and that goes for the white, the hybrid stuff, and they wanted to buy some red, so they approached us and said, “We want to buy a few tons, and how do we get it up to us and what can we do?” And, I don’t think they actually have a winery, I think all their production is custom, either here or there. So anyway, that’s how we got started. And now, every couple of vintages they’ll send some white juice down, and they’ll have us ferment it here because it’s going to be part of a bigger blend or something like that. JM-L: I see. Very interesting. JL: So they’re one. And then there’s Belhurst, Belhurst Castle . . .
JM-L: Are they also in the Finger Lakes? JL: Yes, they are. They’re basically a hotel, a resort hotel, and again, they might have a little show winery, but I haven’t actually been there. But we make their wines, sort of for the same reasons, they’re purchasing all their fruit, both red and white, and we’re making the wine for them. JM-L: Is PWG unique in New York State? JL: Not any more. We were the first on the East Coast as a custom crush, and I don’t know, but I think that there are one or two in the Finger Lakes now. I know that East Coast Crush started up and it’s connected to one of the bigger wineries. I don’t know if it’s the exact same facility or if they have separate business names to bring in more clients, or it’s a whole new facility. Russell might know that. And I think that I heard of another place, White Springs was, again, doing their own thing but doing a lot of custom work, I think that just changed ownership and might now be all custom. JL: But, anyway, we started people thinking about it as an option, since they save a lot of money and only pay for what they’re bringing in rather than buying equipment that’s going to cost them two million to put in and they’re only going to use it once a year, so . . .
JM-L: Yes, like Raphael, which spent six million dollars on their own winery . . .
JL: Yeah, it’s a different interest. If you have the money to invest and you want that showpiece, you know, that’s . . .
JM-L: Well, they have that showpiece, there’s no question of that. Pretty impressive! So, when you have a really abundant harvest out here, even the wineries that have facilities of their own may find themselves with more fruit than they can handle . . .
JM-L: So you do take overage, as it were . . .
JL: Yes. If we have the space for it, sure, and it happens where we have one particular client, another winery that knows pretty much that they’re going to have more fruit coming in every year than they have space for themselves, so they’ve been saying fairly consistently that they need a tank of twenty tons, or something, for this overage. There are other wineries where it’s more vintage-related, most years they’re self-sufficient but some years they’re looking for extra space, so as long as we have the room we’re happy to do that. 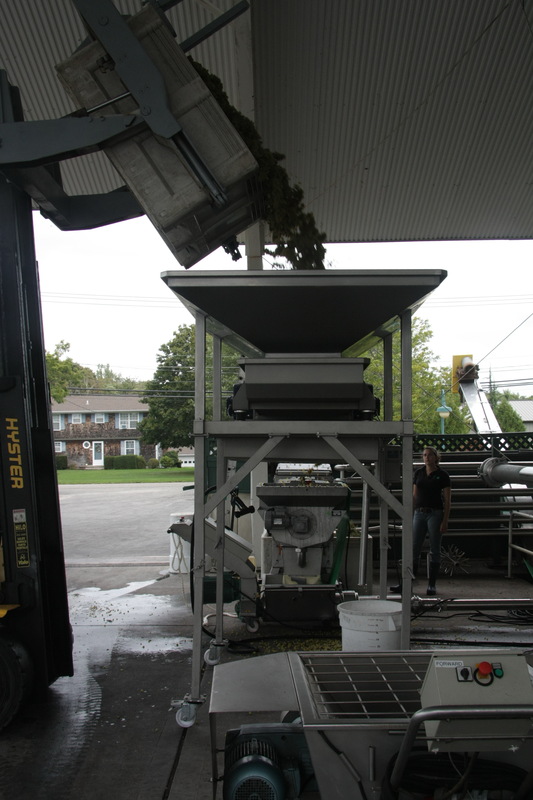 We also do pressing and settling; some Connecticut buyers of wineries, are buying local Chardonnay or other varieties and they’re looking for a place to have it destemmed, pressed, cold settled [chilled], and then they’re taking it as juice so that they don’t have to drive [the purchased grapes] all the way around. So that’s another part of our business that is pretty consistent every year. JM-L: So you’re just sending them the must? JL: Yes, either the must for reds or the settled juice for, say, Chardonnay. JM-L: And then they ferment it. JL: Yes, and we have fee schedules—so they don’t have to bring things just to bottle; we have a pressing and settling charge, or you can ferment it here, age it here, and then sell it in bulk, instead of selling it in the bottle, and you’re not paying the full cost . . . In other words, PWG has a fee schedule for all its varied services that allow a client to decide whether to take a wine all the way to bottle, or to sell it early in the process as juice (before fermentation) or later in the process as bulk wine. JM-L: OK. Well, you and Russell, and who else helped found this? JL: Well, I’m not a partner, Russell is. It’s Russell and Mark Lieb and a fellow called Bernard Sussman—he isn’t located out here. He lives in New Jersey or may have moved to Florida now. They’re the three partners. I’ve been here since it opened. I was working with Russell at Pellegrini Vineyards when he was planning this, and when 2000 was our first harvest he asked me if, when this was done, I’d like to come with him. JM-L: Now, how many clients did you start with? JM-L: Really? So in other words, you first determined that there would be a market out there, you determined that there would be people who would bring their fruit in, if you would just set up . . .
JL: Most of those clients are still with us. I’d say that the only ones that aren’t were the ones that got sold or closed down. But Martha Clara was there the first year, Sherwood House was there, so pretty much everyone who was looking for a place and found us in 2000 has stayed. JM-L: So Deseo de Michael [aka OR Wine Estate as of 2014] is the just latest . . . ? JL: Yes, pretty much. Around 2010, in terms of having a license and all of that. But for example, my wine, which is a 2007, and Erik [Bilka], who makes a Riesling from Finger Lakes juice that he brings down, and he started in 2009, and that’s it; it’s not so much new vineyards coming on line anymore, but rather people buying fruit who want to start their own brands. JM-L: I see. So let’s talk about you . . .
JL: I don’t own my own vineyard; my situation is a little different in that I lease two acres. Well, I have a long-term agreement since 1999, with a particular vineyard to lease the two acres and I bring in my own fruit, with the understanding that I’ll do all the handwork. I do the pruning, I do the thinning, I do the harvesting. JM-L: So you’re not buying fruit, you’re essentially the vineyard manager for a parcel that’s leased to you. So you have complete control of the fruit. JL: Yes. The things that I didn’t have control over—I started at Martha Clara in 1999–where they controlled the spray schedule, the weed control, anything that had to do with tractor work—I could make suggestions. So in that respect I didn’t have complete control. But I was fine with that. That lasted until 2006, when they decided that they wanted to harvest their own fruit on that plot, so they decided that I was too small to make an exception for . . . so I was all ready to move anyway, and I was fine with that; it was time to move on. So I continued the same arrangement with Pellegrini Vineyards, in their easternmost vineyard, called South Harbor. So there were two acres planted with Merlot there as well, same arrangement as before, so I don’t have control of the spraying schedule. So I worked with the vineyard manager and that worked out nicely. That was between 2007 through 2010. In 2010 I started working for Onabay Vineyard as a winegrowing consultant, working out in the vineyard. 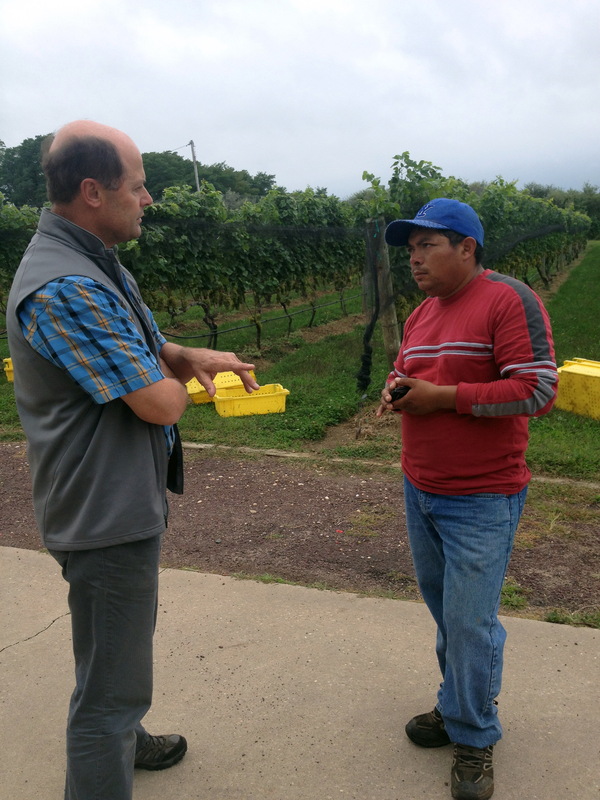 So they asked me, would I be interested in leasing a couple of acres with them, and since I was already telling them what to do and hands-on with their whole vineyard it finally meant that it felt like my own vineyard, in that sense. JM-L: Oh, that’s very nice. JL: So in 2011 I moved to Onabay. I was very happy with Pellegrini, but at Onabay, where they’ve planted several varieties, I was able to have an acre of Merlot, half-an-acre of Cabernet Franc, and half-an-acre of Petite Verdot. JM-L: So you were finally able to make a Meritage. JL: Yes. And I did . . . since 1999 I’ve made wine every year, selling it off in bulk, but bottling a barrel for myself to have something to drink, and. . .
JM-L: I see. So now you’re now making wine in your own way—originally you were only making Merlot . . .
JL: Only growing Merlot. So the early vintages were 100% Merlot, but I started to go to other sources—Premium, for example, and other clients, to get a little bit of Cabernet Franc, Cabernet Sauvignon, whatever happened to be available depending upon the year, including Syrah, Malbec, as well. Working here made it easy for me to know what was out there—the quality, the amounts, whatever was available . . . 2007 was the first wine I bottled and labeled myself; up to 2006 it was a just hobby project, what I kept at home for drinking myself and then to cover costs I’d sell most of the bulk; I sell anywhere from 200 gallons to 1000 gallons a year depending on my harvest yield and my blending needs. JM-L: And how much bulk are you selling now? JL: Depending on the harvest . . . it was a lot, anywhere from 500 cases to a 1,000, or 200 gallons, some years there wasn’t very much. The 2007 was a blend of Merlot, Syrah, Petit Verdot . . . it’s not all Merlot. JM-L: Which means that it’s more of a Left Bank than Right Bank Bordeaux style of wine. JL: Yeah, with the Syrah tossed in too. JM-L: And with the Syrah, which in the 19th Century, they used in winemaking in Bordeaux. JL: Yes, I read that too. I’m not going to market it as Bordeaux . . . it’s just was the best that I could do. JM-L: Of course you’re not going to label it as Bordeaux. Despite all the claims about how Bordeaux-like your wine is, this is still Long Island, after all . . .
JL: Exactly. There’s no French on the label, it’s just Leo Family Red . . .
JM-L: And where is it available? Can I buy it, for example, at Empire State Cellars? JL: It’s available there; you can also buy it at the Winemakers’ Studio, that’s my biggest outlet . . . Anthony Nappa’s. They pour it and sell it on a regular basis. There’s also a small wine shop right here in Mattituck, called J. Shields. It’s owned by a woman who’s a real oenophile. She just loves wine; I think she studied the sommelier’s course . . . so she took it in a couple of weeks ago. So it’s on the shelf there. JM-L: What was your aim in making your particular wine? JL: Honestly, it’s kind of a cliché. I wanted to make a wine that I would enjoy drinking. There are no asterisks. I wanted it to stand on its own on a commercial level. I want make it only in good vintages and have it taste better than what people are expecting. . I wanted to be able say: Taste it and if you like it, buy it, and if you don’t, well, there are no questions asked. I made 420 cases, I think I have about 160 left. If I’m stuck with a hundred cases, fine, I’ll be happy to drink it for the rest of my life. JM-L: So you’re really saying that the 2007 has great longevity. JL: Yes, I think it does. Because I released it last year and it’s certainly drinking better this year. It hasn’t shown any signs of fading and improving still. JM-L: You think that it has the structure to last another five, ten years? JL: Five, ten years from now? I think so, but I honestly don’t know? It’s hard to say. Two to three years to reach its peak, and how long will it hold? JM-L: Well, as you know, that’s a sign of good wine and good winemaking. The very fact that there is so much wine being made in Long Island that is age-worthy is, I think, a stunning testament to the level of the winemaking here, and the quality of the fruit and everything else. It’s no secret, after all, that for us, that the quality of the wine from Long Island is, frankly, at times sensational—and, well, times that it’s not— but given how good it is I often to prefer it to that of California. JL: I’ve come the same way, obviously I’m in the industry and you could say that I’m completely biased, but I’m less and less happy when paying sixty or seventy dollars for a California wine that turns out to be an ordinary red wine, just high in alcohol but without much character. JM-L: As soon as Robert Parker says “jammy and full of fruit,” I know immediately that that is a wine that I’m not likely to touch. JL: Exactly. They’re making a style. Good for them. They’re marketing a style and making it work. We’re just not that. JM-L: The other thing to remember is that everything here is “micro.” You just do not have the production to take on California, you just can’t make enough for a national market. JL: And that should free us up a lot to experimentation, to be able to focus on quality, which more and more of our customers are asking for over the twelve years we’ve been in the business; at first our clients were just happy to get the fruit in, get it at 22 Brix, get the right pH. It’s got to have flavor. We’re all working on making higher quality wine, we’re challenging one another, we’re raising the bar. JM-L: And what other vintages have you made since the 2007? JL: Put into bottle and labeled—just the 2010. JM-L: And that was a fabulous vintage. JM-L: Well, that’s a good policy. JL: Well, it’s nice to have a day job! JM-L: John, you’ve been more than generous with your time, and I thank you for it. I’ll get back to you when I’m ready to write about Clovis Point. Erik Bilka, who was not interviewed, is the other production winemaker at Premium, and also has his own wine label: Influence—a Riesling made from grapes sourced from Ovid Farm in the Finger Lakes. “Every vintage a winemaker’s goal is to showcase the best attributes from the fruit he is presented. Fruit intensity, acidity, and sugar balance are all attributes which bring a wine to a harmonious blend of aroma, flavor, and palette impression. The winemakers’ influence determines the quality seen in the glass. To me, the commitment by the oenologists who work at PWG simply goes beyond the normal range of expectation and duty. For each of them is so passionate about wine, and apparently has so much excess energy, that it’s not enough for them to only work full-time at their place of employment, they have a deep need to practice their skills for themselves and their reputations. One can’t ask for more devotion than that. It’s also hard to find better winemakers. Services provided by Premium Wine Group range from grape sourcing, crush/pressing, fermenting, barrel aging, bottling, Methode Champenoise riddling and disgorging, and Compliance Issues. These services are available to “custom production” clients, Alternating Proprietorship and existing wineries. 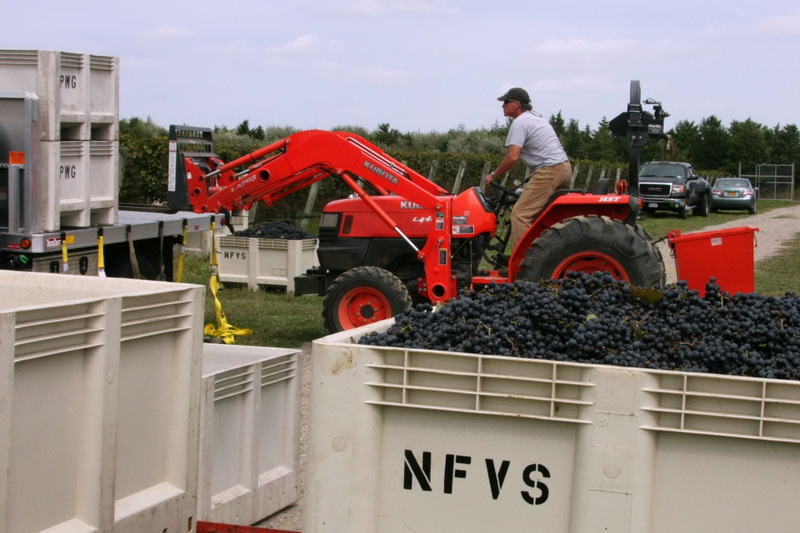 North-East wineries sourcing North Fork of Long Island fruit may wish to ferment rather than move unstable fruit during harvest. Or those that have exceeded their own production capacity might look to utilize our wide variety of equipment. Contact us for (Fee Schedule or Component Services Fees) and (Standard Procedures for what is included). Full in-line 4,000 bottle/hour bottling line. Our facility has a fully-equipped laboratory, with a full-time Lab Director and assistant during the Harvest period. 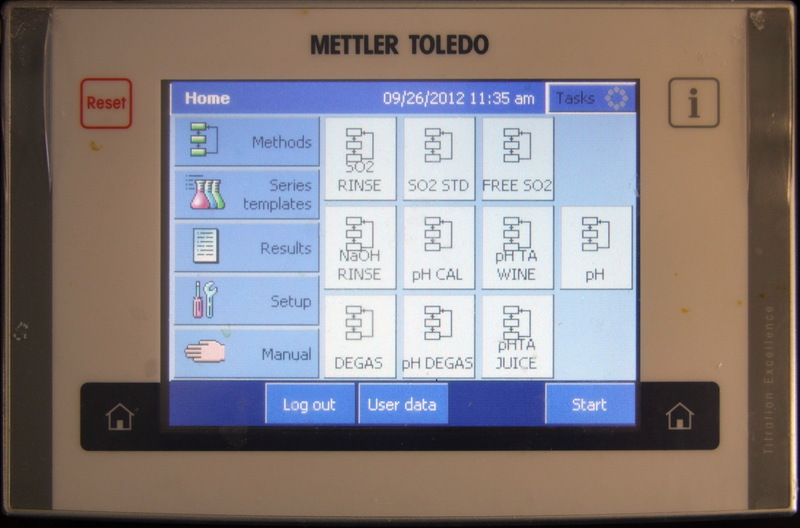 A production software system (Winemaker Database) allows our clients’ bulk inventory to be tracked from the time juice or bulk wine arrives at the winery, every mo vement, addition, chemical analysis and process is recorded and tracked. 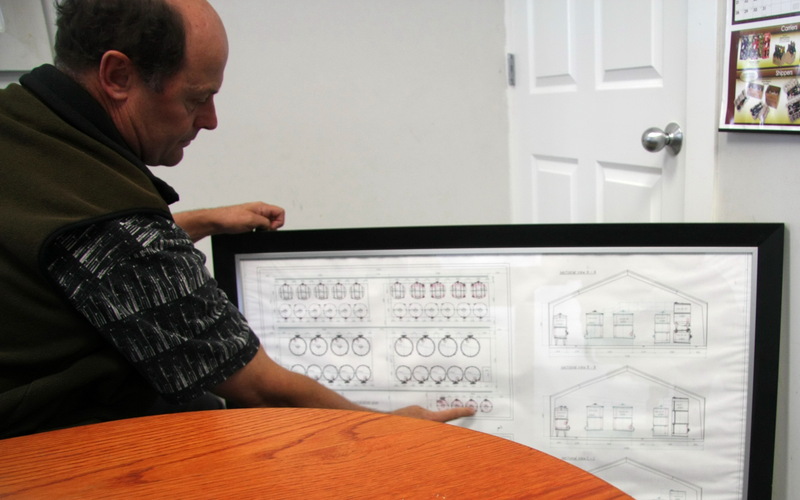 Our clients have full access to this detailed history of their inventory. We can receive hand harvested fruit in small half-ton bins, or machine harvested in gondolas. The receiving pad consists of a Weightronix truck scale and printer, two 7-ton Membrane presses with s/s dump hopper for whole-cluster pressing. Two destemmer / crushers: Rauch E20 and Euroselect ES, to ensure uninterrupted receiving capacity. 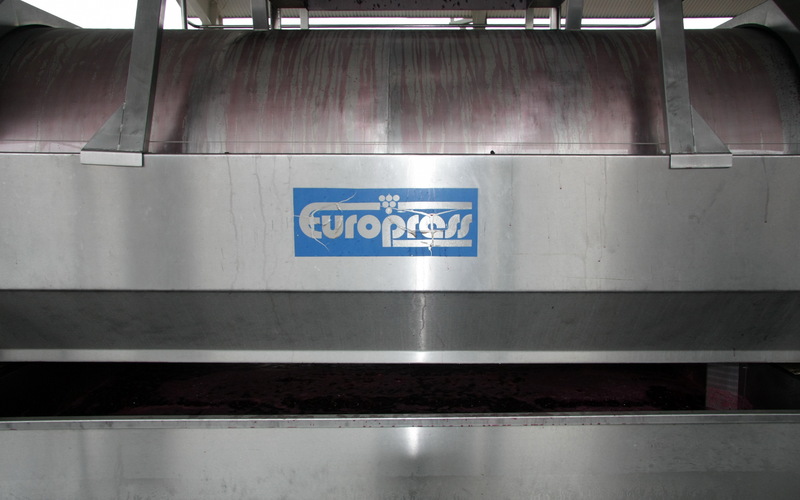 Both presses utilize direct to press systems, if requested, to minimize solids and for “dug-out” red fermentations. Our 50-ton Refrigeration system ensures more than sufficient capacity for rapid cooling of juice. Tube-in-tube must-chiller capable of decreasing must temperature 20ºF. Additionally we have a 700 KW generator to ensure uninterrupted electrical service. Numerous ‘gentle on wine’ Waukesha (twin lobe) pumps. Pneumatic ‘punch-down’ tool above (18) red fermentation tanks. (2) in-line tank heaters to maintain warm red ferments, correct malo-lactic temperature in tank, pre-bottling temperature control. Crossflow filtration system Vaslin Bucher FX 3 with lees filtration add-on capability plate and frame pad filter as well as membrane cartridge filtration capability. This entry was posted in Vineyards, Vinification, Wineries and tagged Anthony Nappa, Baiting Hollow Farm Vineyards, Belhurst Castle, Bernard Sussman, Bouké Wines, Bouquet Wines, Comtesse Thérèse, Derek Wilber, Deseo de Michael, East Coast Crush, Erik Bilka, EuroSelect, Gilles Martin, Harbes Vineyard, Influence Wines, John Leo, Juan Micieli-Martinez, Leo Family Red, Leo Family Wines, Lieb Cellars, Long Island Wineries, Mark Lieb, Martha Clara Vineyards, McCall Ranch, Oenoconcept, Onabay Vineyard, OR Wine Estate, Pellegrini Vineyards, Premium Wine Group, Pumphouse Wine, PWG, Queens County Vineyard, Russell Hearn, Sherwood House Vineyards, Sick International, Silver Springs Vineyard, Sparkling Pointe, Suhru Wines, T'Jara Vineyard, Tom Drozd, Tube-in-tube Must Chiller, Vaslin Bucher FX 3, Vaslin Bucher FX 8, White Springs Winery, Winemakers Studio on 11 February 2013 by JoseM-L.